The all-new 2016 Honda HR-V blends the best traits of the CR-V SUV and Fit hatchback. The HR-V features the higher seating position and available all-wheel drive of an SUV and the cargo-swallowing abilities of the Fit. It is poised to be a leader among a wave of subcompact crossover SUVs that includes the Mazda CX-3 and Fiat 500X. Sporty mini suv that is overall great but is missing a few key features that can become annoying to be without. My Honda HRV is a smooth sports like mini suv. It looks small but has plenty of space in the car as well as the back/truck. There are great features such as built in navigation, backup camera as well as a turning camera when you use your left signal to turn or merge. It has an electric break but the light comes on for that on the dashboard so that is a negative. I've had it looked at by the dealership and the light returned one day later. Another negative is that will all the technological advancements in the car, they still put a manual seat adjuster in for the driver. I cannot stand that. My 2003 camry had an electric seat adjuster and I am still shocked that this 2016 mini suv has a manual one. I also have to manually open the back/trunk. The button on my key does not work and there is not button from the inside. There was also no manual that came with the car. They expect me to look up everything online. It offers excellent performance. .
Love the vehicle, but not some of the features. Very little storage. Center console bin and door bins are almost useless. Cup holders are too close together for two people to comfortably use. Rear cup holder does not have enough clearance to put anything other than a short glass in it. Cargo space very small. Has no bins or pockets in which to, store anything so even small items just roll around. Cannot buy a retractable convert for the cargo area. Only hard covers are available - at least the last time I checked. Outlets for charging phones, etc. are located in a very awkward location you cannot see the outlet without leaning into the passenger seat. On a positive note, performance is excellent as is typical in Hondas. I will buy another Honda, but I will not buy another hr-v.
Just like Doctor Who's tardis, it's much bigger on the inside! What I love the most is the amount of space available inside the car. Before buying the HR-V, I'd been driving a full sized van, and was worried about moving to a smaller car. I can fit just as much inside the HR-V as I could in my large van! I've moved everything from groceries, to bikes, to furniture in it. Plus it's a very reliable car, comfortable, and attractive. The only thing I don't like about it is the way the headrests tilt slightly forward. It's probably fine for taller people, but I'm kind of short, and when I pull my hair back, the headrest is at the height and angle where it presses into whatever hairclips I'm wearing on the back of my head, and it gets very uncomfortable. 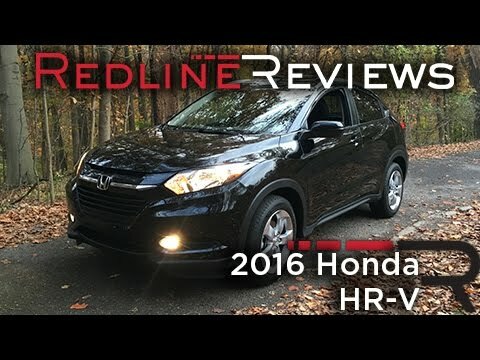 2016 Honda HR-V Crossover Review DETAILED! In 4K!